The geopolitical dynamics of the New Cold War have made it so that France – and not the UK or Germany – is the US’ “special partner” in Europe given Paris’ much broader pan-hemispheric influence and its pivotal place in Washington’s developing Asian alliance system. 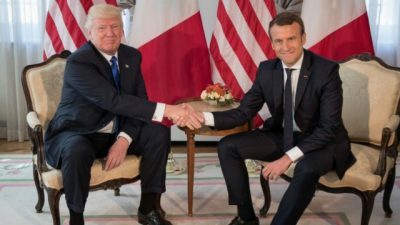 The days when the UK or Germany could be considered the US’ top European partner are gone and France has now emerged as Washington’s chief ally on the continent. The UK is mired in post-Brexit domestic political chaos and is decisively turning inward during the indefinitely long transitional period of recalibrating its foreign policy towards the EU and the British Commonwealth. This has made the island nation much less attractive of a strategic partner than ever before and compelled the US to urgently search for a replacement. Germany, which used to vie for this position during the Obama years, has totally lost its luster under the Trump Administration due to the two Great Powers’ ideological and economic differences. Moreover, the country is inextricably tied to Russia via the existing European pipeline network and the new ones being spearheaded under the Baltic and Black Seas, thus making it “strategically unreliable” from the perspective of long-term American policymaking calculations. The time has therefore come for the US to replace its maritime and mainland “special partnerships” with the UK and Germany, respectively, and France fits the role perfectly because of its hybrid geostrategic nature as Western Eurasia’s mainland-maritime nexus. The country is a continental power in terms of the influence that it wields over Southern Europe (particularly the “PIGS” countries) while it’s a maritime one because of its vast colonial legacy in Africa and parts Asia (mostly the Mideast and Southeast Asia). In fact, France can be regarded as an African superpower despite not having any actual mainland territory there simply by virtue of its financial and military strength through the two African Franc systems and the ongoing Sahel-spanning “Operation Barkhane” multinational anti-terrorist mission, to say nothing of its network of bases and historical tendency to intervene all across the continent at will. The US has no greater ally in Africa than France, and the two Great Powers cooperate extensively in hegemonically managing its affairs and attempting to “contain” China. In addition, these two countries could conceivably cooperate with the Indo-Japanese “Asia-Africa Growth Corridor” (AAGC) and even bring the UAE into this framework given its growing Horn of Africa influence. This analytical angle brings the article to the point of discussing the Asian aspect of France’s strategic significance to the US. Paris is trying its hardest to regain its long-lost Mideast influence through Macron’s leading involvement in attempting to resolve last year’s Hariri affair and his country’s enthusiastic participation in the latest Syrian strikes. Prior to that, France opened a base in the UAE in 2009 and has since cultivated close ties with the Emirates’ GCC Saudi ally too. The Levantine and Gulf components of Paris’ Mideast policy give France the perception of greater regional weight which it has attempted to leverage in exerting influence over Iran. Of all the five Mideast states mentioned, the UAE is nevertheless the most important one for France because “Little Sparta’s” transregional influence in the Peninsula & its nearby Horn of African environs pairs well with the Abu Dhabi Crown Prince’s mentor role over his Saudi counterpart and arguably makes it one of the world’s fastest-rising powers. The UAE has also moved very close to India in recent years, as has France, thus allowing one to speak of a trilateral strategic complementarity that perfectly aligns with the US’ grand interests. The Emirates hosts a sizeable Indian diaspora community that provides low-wage labor for the developing powerhouse, and Abu Dhabi recently pivoted from its historical partnership with Pakistan towards India owing to Islamabad’s refusal to participate in the War on Yemen. India has since played an important role in this conflict by providing medical services to the “coalition’s” injured fighters, and its American-friendly Prime Minister Modi even visited the country and announced New Delhi’s intentions to take ties to the next level. It’s therefore obvious why the US and France’s UAE ally would make a logical addition to the Indo-Japanese AAGC given that it has plentiful resources to invest in the continent and the intention to do so after establishing itself as a Horn of Africa power. France, on the other hand, has more of a military partnership with India than the UAE’s economic one, and the two Great Powers are presently exploring several weapons deals with one another. Relatedly, Paris and New Delhi also recently agreed on a LEMOA-like military pact that allows them to use each other’s bases, therefore theoretically giving India access to France’s facilities all across Africa and especially its crucial naval one in Djibouti. The convergence of French, Emirati, and Indian interests around the Bab el-Mandeb maritime chokepoint connecting EU-Chinese trade could become a powerful force in the New Cold War and represents an unfolding alliance system in line with American interests that neither the UK nor Germany can provide. It’s for these larger and far-reaching strategic reasons involving Africa, the Mideast, and South Asia why France is fast becoming the US’ new “special partner” in Europe and one of its most important allies anywhere in the world.